Vapiano ! An innovative European concept serving made-to-order fire roasted pizzas, fresh house-made pasta and hand tossed gourmet salads. According to an Italian proverb, “If you have an easy-going and relaxed approach to life, you’ll live more healthily and longer”. And this is exactly the attitude which is lived every day in our Vapianos—by both our guests and our employees, the Vapianisti. It has been this way since the 22nd of October, 2002, when the first Vapiano in Hamburg, Germany, opened its doors at the “Hohen Bleichen”. Two years later, the founders decided to set Vapiano on a world tour as a franchise concept. Today there are already 200 Vapianos in more than 33 countries on 5 continents, and many more international openings planned for the future. 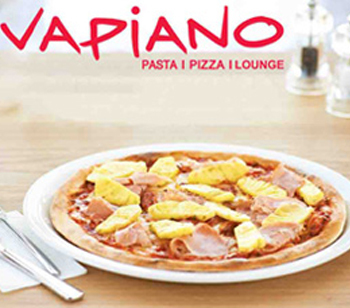 Suncity Ventures is a franchisee of Vapiano in Bahrain, Kuwait and Saudi. Vapiano Bahrain is located in city centre mall, Vapiano Kuwait are in Al Kout mall & The Avenues mall , Vapiano Saudi Arabia are located in Dhahran mall, Alkhobar, & in Jeddah city.